I guess the Martini stickers were holding that piece of Massa's car. You'll notice no Jonnie Walker branding on that McLaren. I have always mentioned JB as a worthless champion (Brawn GP) ... But I was so wrong!! Not sure why I misread that!! Looks like the same part of Bottas' car has fallen off too, at the same part of the circuit. How bizarre. 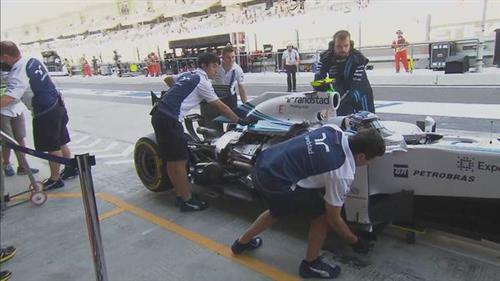 Both Williams back into the pits. Rosberg seems to do so much better when he has nothing to lose. Early days, but he seems to have the edge so far. @Siddhesh: Interestingly, when he was at Williams his mechanics said he was guilty of "going to sleep" in races. Showing great one-lap pace and then dropping off the pace in the races. Would suggest that has been an issue for him at times this season. Everyone back into the pits as we enter the final hour of the session. Teams will now hand back those additional soft tyres to Pirelli. Having no Jonnie Walker on the McLarens gets them ready for next year since Bernie stole them. Silence descends over the Yas Marina circuit once again with all the drivers back in the pits. Good shot there of both the Martini-less Williams (notice no red and no logo) as well as the huge chunk missing on the side of Bottas' car. Williams panels falling off reminds me of them running underweight in the 80's. 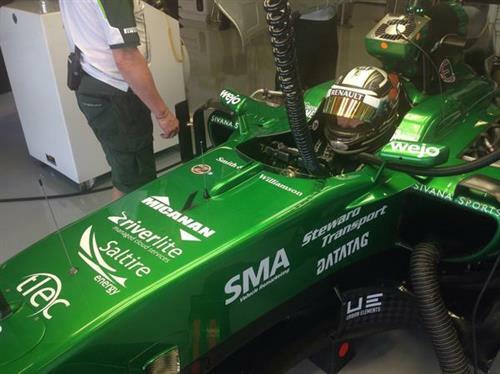 Safety was of course an issue raised at Caterham by Kobayashi before it went into administration. I think a few eyes in the paddock will be looking across at the team in green this weekend on its return to the grid. Only Stevens and Magnussen yet to set a time. New boys Ocon and Fong currently 16th and 17th, with only Kobayashi slower so far. @Aditya: Maybe. Rosberg will be going all guns blazing if he's in P2. But starting pole and sprinting off into the distance is surely still the most ideal strategy. If a car finishes the race with some missing bodywork which causes it to be underweight do they penalize the driver? @PA: That would be a race-ending issue for any team, as aerodynamics would be so badly affected. I think Lewis would want to be P1 to maximise the pressure on Rosberg. We've already seen NR make a critical mistake in response to pressure once this season. Raikkonen has done only 6 laps. Any issue with his Car. @Mohan: Ferrari hasn't said anything - there's some work going on in the garage on Kimi's car but he is sat in the car, suggesting things are OK.
@Anandnerusu: Force India has fallen behind McLaren in the aero war recently. There's still a chance double points could help it finish above McLaren but it would take an almighty result this weekend. @Glen: Well remember, there's lots of things we don't know about this session, such as fuel loads etc. It's also a wing built for next year's car, not this year's. Look at all those logos. Sign of the future for the small teams? 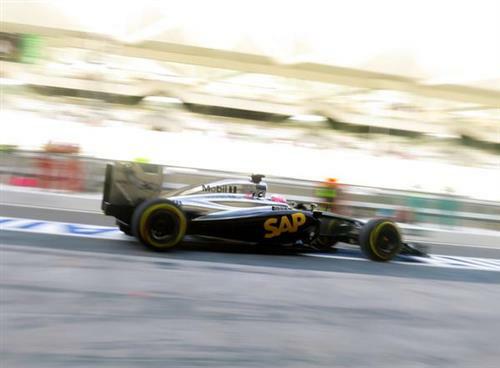 I just read an article where it said Indian GP to be back in 2016... Is this even true? Or it is a classic Bernie - Promise something. Do another. @RohanMehta: Bernie is always talking about the Indian GP. I think he's trying to put pressure on event organisers but it seems unlikely it will return in the next few seasons. Vettel breaks the silence and ventures out on track. Wonder why the small teams don't try to sell low cost areas of their cars. JEV and Ocon join Vettel on track, as the world champion starts a timed lap. Is Mr. Ocon really driving a Sauber and two Lotus??? @Dags: No. Our timing screen is being a bit of a rascal. We're working on that glitch. So that's the end of Bottas' session. Interesting that Williams started this session so strongly - usually its drivers are nowhere on Fridays. F1 seems so contrived now with all it's supposed equalizing rules that frankly only seem to make it weighted towards the Big teams that one more silly idea probably wont hurt. So how about what ever points you get from the previous race, you get that to carry as extra ballast in the next race. Get 25 pts for the win, carry 25 extra Kilos, what do you reckon? @LD: Quite a few series of Touring Cars do that. It's not very F1.